Filling up on turkey, stuffing, and pumpkin pie is likely to be high on the agenda this Thanksgiving. By late afternoon, many of us will be fully immersed in a “food coma,” dozing in front of the TV with no intention of moving for the rest of the day. But precisely what is behind this food-related fatigue? New research sheds light. 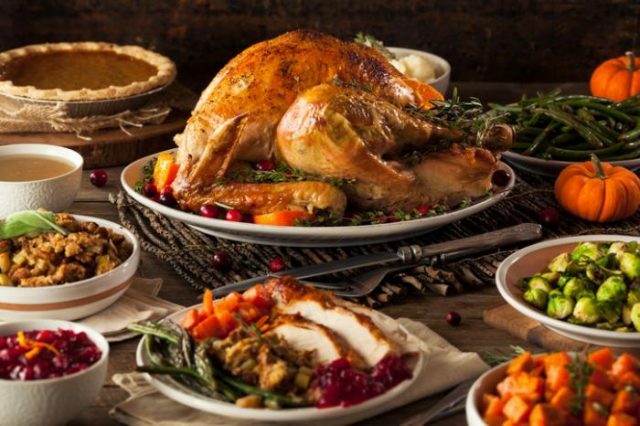 Researchers find protein and salt intake might be to blame for the Thanksgiving food coma. According to the Calorie Control Council, the average American consumes more than 4,500 calories and 229 grams of fat on Thanksgiving Day. A Thanksgiving meal can contain around 3,000 calories alone, while celebratory drinks and nibbles throughout the day easily add a further 1,500 calories. There is a widespread notion that the turkey is to blame; this popular Thanksgiving bird contains an amino acid called tryptophan, which has been related to post-meal fatigue, as it can boost the production of hormones that tell us when to sleep. However, many researchers suggest this theory is a myth, pointing out that many other foods – including chicken, eggs, fish, and yogurt – contain comparable or higher levels of tryptophan. 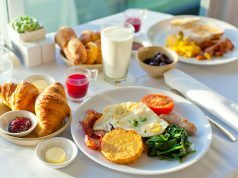 In the new study – published in the journal eLife – researchers from The Scripps Research Institute (TSRI) in Florida point to other possible causes of the so-called food coma: protein and salt. To reach their findings, study leader William Ja, of the Department of Neuroscience and the Department of Metabolism and Aging at TSRI, and colleagues studied the fruit fly Drosophila melanogaster. Fruit flies share more than 60 percent of their DNA with humans, and studies have shown that the insects share around 75 percent of human disease genes. As such, fruit flies are considered ideal models for scientific research. Ja and team developed a system called the Activity Recording CAFE (ARC), which enabled them to measure fruit fly activity before and after eating. The ARC system revealed that – similar to what happens in humans – the fruit flies slept more after eating a large meal, sleeping for around 20-40 minutes. Additionally, the researchers found that the more food the fruit flies ate, the more they slept. On further investigation, the researchers found that the increased need for sleep was driven by intake of protein and salt, while sugar intake had no impact. In the next part of the study, the team sought to understand how food intake affects the brain to trigger post-meal fatigue. Previous studies have suggested that nerve cells, or neurons, called leucokinin (Lk) play a role in how much of a meal we want to consume, which indicates that Lk neurons act quickly while we eat to alter feeding behavior. Indeed, by using genetic tools to activate and deactivate neurons in the fruit flies, the team found that Lk neurons play a role in fatigue after a large meal. “A subset of leucokinin receptor (Lkr) neurons was necessary to initiate post-meal sleep in the presence of protein specifically,” explains first author Keith Murphy, also of the Department of Metabolism and Aging at TSRI. Overall, the researchers believe their ARC model provides some insight into why our Thanksgiving Day meal might leave us feeling more than a little sluggish. Read about how to have a healthy Thanksgiving.